Broadcast TV news neglected many critical climate change stories in 2017 while devoting most of its climate coverage to President Donald Trump. Seventy-nine percent of climate change coverage on the major corporate broadcast TV networks last year focused on statements or actions by the Trump administration, with heavy attention given to the president's decision to withdraw from the Paris agreement and to whether he accepts that human-caused climate change is a scientific reality. But the networks undercovered or ignored the ways that climate change had real-life impacts on people, the economy, national security, and the year’s extreme weather events -- a major oversight in a year when weather disasters killed hundreds of Americans, displaced hundreds of thousands more, and cost the economy in excess of $300 billion. You can find a PDF version of this study here. For this study, Media Matters examined 2017 coverage of climate change on broadcast TV networks, which included segments devoted to climate change and segments in which a media figure made substantial mention of climate change. We analyzed coverage on ABC's, CBS', and NBC's nightly news programs and Sunday morning political shows. We also analyzed FOX Broadcasting Co.’s syndicated Sunday morning political show, Fox News Sunday. FOX Broadcasting Co. does not have a nightly news program, so, overall, there was far less FOX airtime to analyze. In addition to the corporate broadcast networks, we examined weekday coverage on PBS's nightly news program, PBS NewsHour. PBS does not have a Sunday morning political show. The Trump administration drove climate coverage in 2017: 79 percent of the time that corporate broadcast networks spent covering climate change, or 205 out of 260 total minutes, featured actions or statements by the Trump administration. The networks gave vastly less coverage to the many ways that climate change affects people's lives through its impacts on things like extreme weather, public health, and national security. Virtually all coverage of climate change on Sunday shows -- 94 of 95 minutes -- revolved around the Trump administration. President Donald Trump's decision to withdraw the U.S. from the Paris climate agreement dominated coverage of climate-related policies and news events, being featured in 52 percent of all climate segments on the corporate broadcast networks. The Trump administration's rollbacks of other climate protections like the Clean Power Plan received far less coverage. 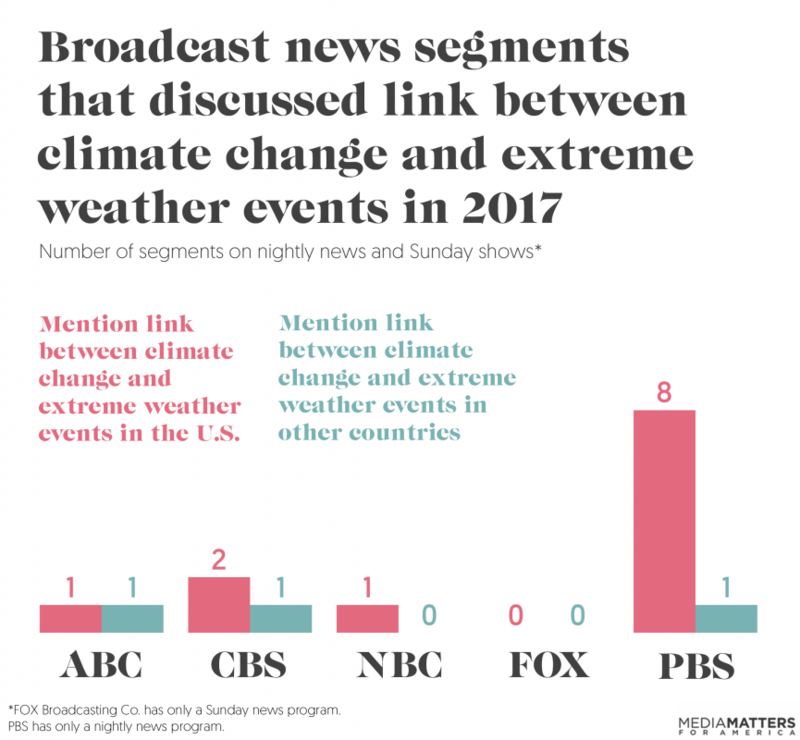 Despite 2017 being a record year for weather and climate disasters, the corporate broadcast networks rarely covered the link between climate change and extreme weather events in the U.S. They aired only four total segments that discussed climate change in the context of disasters that happened in the U.S. last year, including just two that mentioned climate change in the context of hurricanes Harvey, Irma, or Maria. 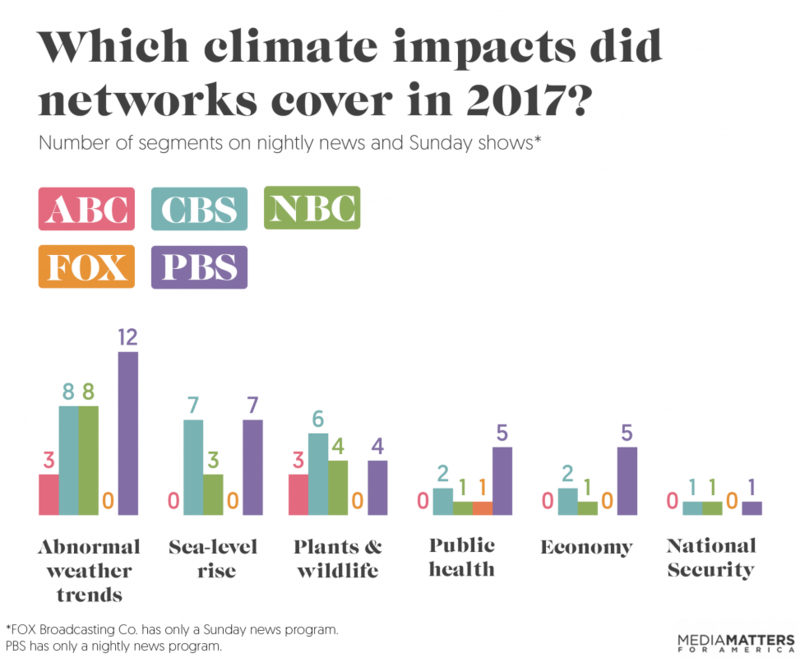 CBS and PBS led all broadcast networks in the number of segments they devoted to climate change in 2017, as well as in coverage of climate-related scientific research and number of climate scientists interviewed or quoted. But CBS and PBS were also the only two networks to feature guests who flatly denied that human activity causes climate change. Network climate coverage in 2017 heavily featured climate denial, most of which came from Trump and officials in his administration. Nineteen percent of the networks' climate-related segments mentioned that Trump has called climate change a "hoax," and 37 percent of those did not rebut that claim by noting the scientific consensus around climate change or affirming the reality of climate change. 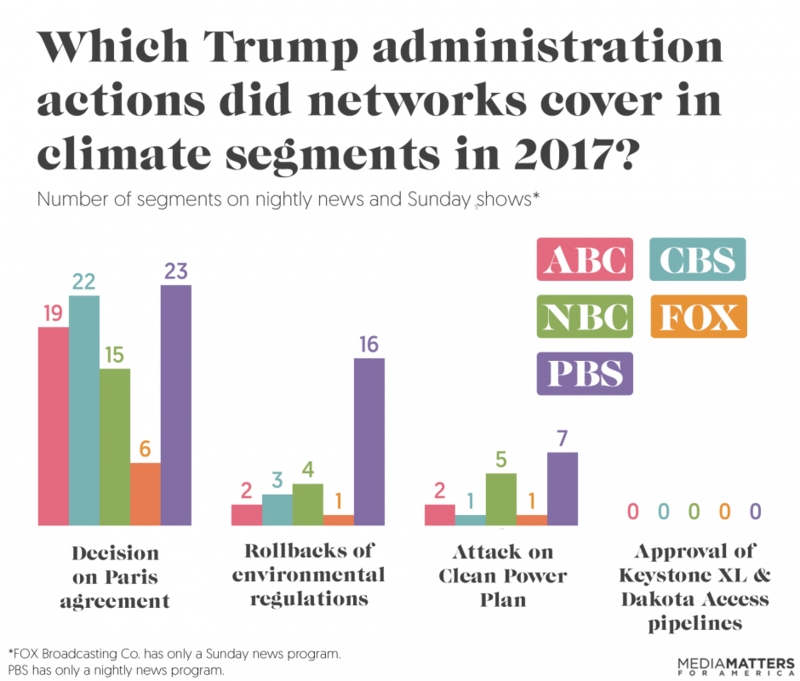 Majority of climate coverage on corporate broadcast networks featured actions or statements by the Trump administration. 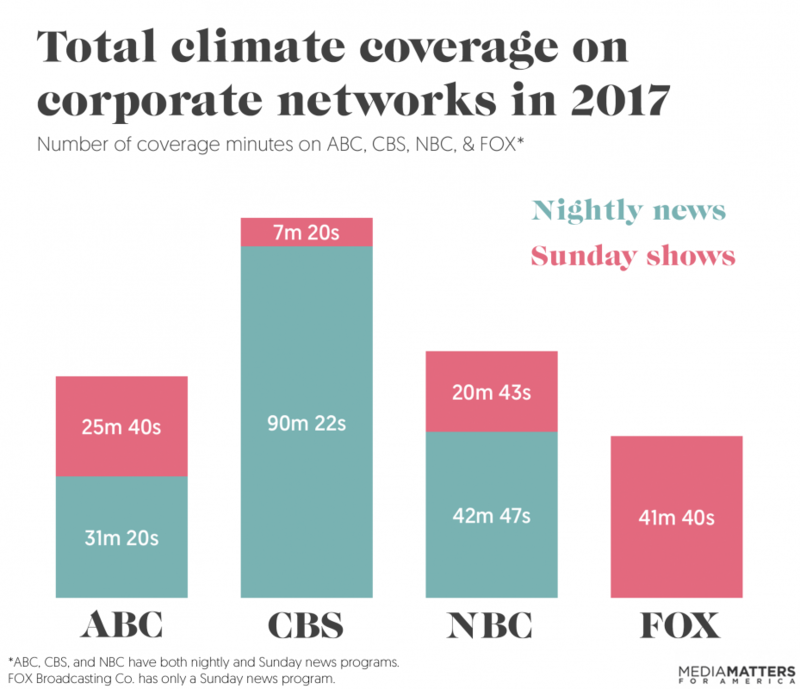 In 2017, ABC's, CBS', and NBC's nightly news and Sunday morning programs, plus FOX Broadcasting Co.’s Fox News Sunday, aired a combined 260 minutes of climate coverage. Of that total, 79 percent, or 205 minutes, featured actions or statements by the Trump administration, most often President Donald Trump’s decision on the Paris agreement and his personal views on whether human-caused climate change is a scientific reality. Analyzing the coverage in terms of the number of segments, instead of minutes, also showed a heavy focus on the Trump administration. 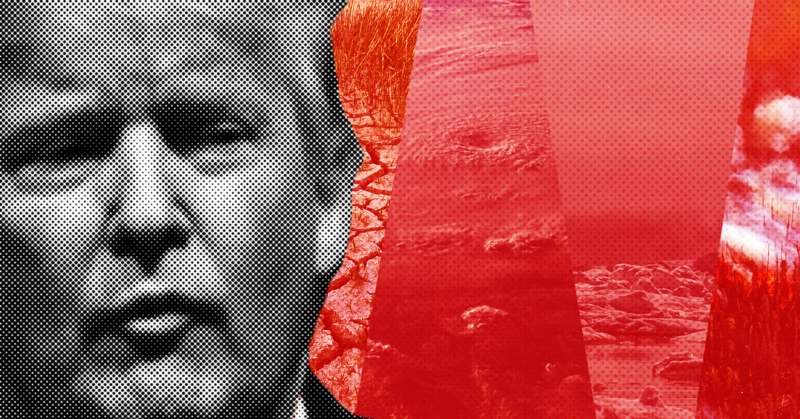 We counted climate-related segments on ABC, CBS, NBC, and FOX, plus those on PBS NewsHour, and found that out of 188 total segments, 68 percent, or 127 segments, were about actions or statements by the Trump administration. 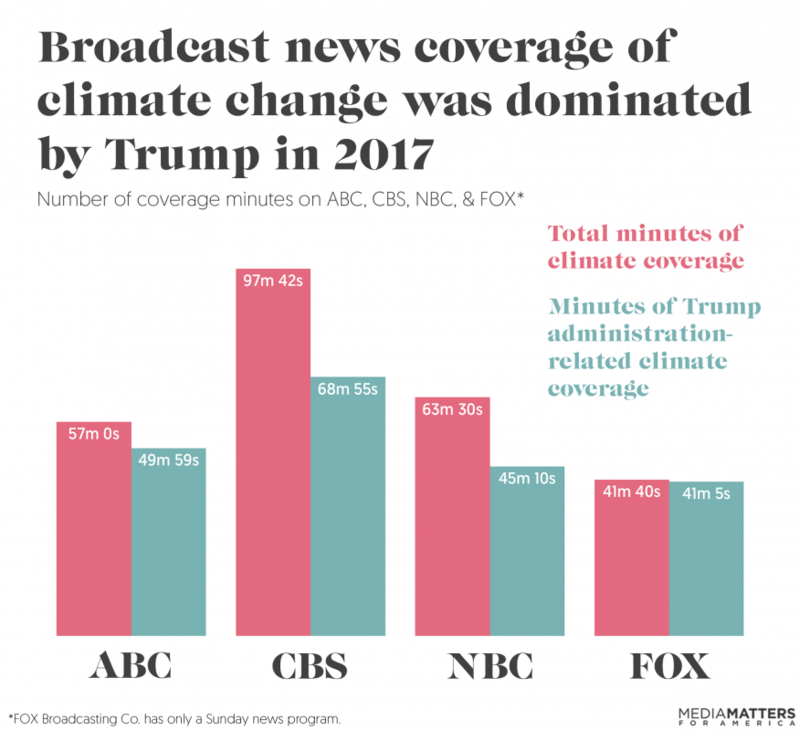 While the Trump administration's unprecedented attacks on climate protections certainly warranted attention, the broadcast networks' coverage was too narrowly focused on the Paris decision and Trump's climate denial. Attacks on the Clean Power Plan, auto fuel-economy standards, and other important climate policies did not receive adequate coverage. 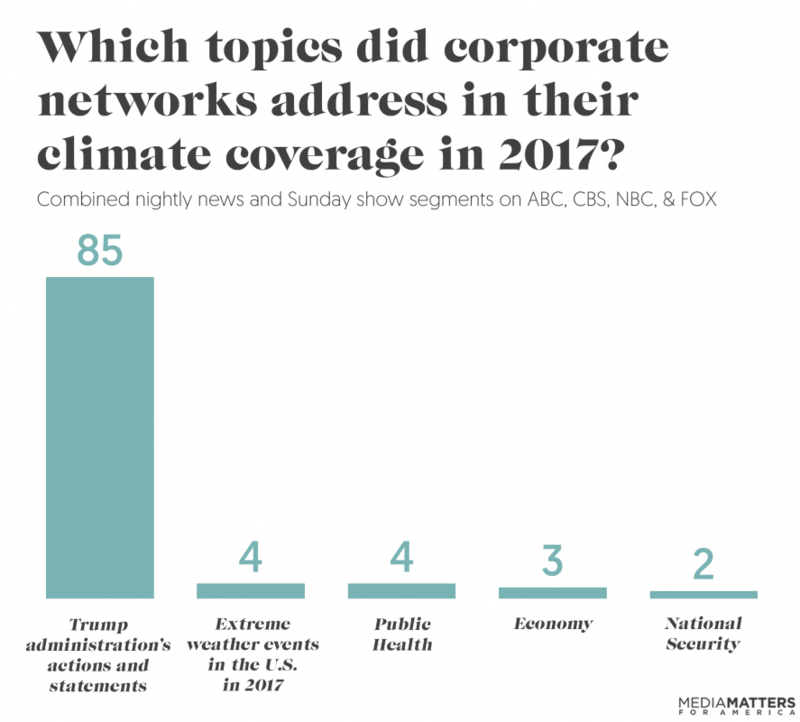 And the corporate broadcast networks often missed important climate stories that did not involve Trump, including developments in climate science and the impacts of climate change on extreme weather, public health, and the economy. Virtually all of the Sunday show climate coverage revolved around the Trump administration. The Sunday shows aired a combined 95 minutes of climate coverage this year, 94 of which featured actions or statements by the Trump administration -- most often Trump’s decision on whether to remain in the Paris climate agreement. More than two-thirds of nightly news coverage of climate change was about the Trump administration. On the corporate nightly news programs, Trump did not entirely monopolize climate coverage, but he was still the focus of a heavy majority. Out of a combined 164 minutes of nightly news climate coverage on ABC, CBS, and NBC, 68 percent, or 112 minutes, featured Trump administration statements or actions. Looking at the number of segments, and including PBS NewsHour, we found that still about two-thirds were focused on Trump. Out of 163 climate segments on the nightly news shows, 65 percent, or 106 segments, featured Trump administration actions or statements. On every network, a majority of coverage was related to the Trump administration, with ABC’s World News Tonight having the highest percentage of Trump-related climate coverage (78 percent), followed by CBS Evening News (71 percent), PBS NewsHour (61 percent), and NBC Nightly News (56 percent). 2017 was a record year for weather and climate disasters, yet corporate broadcast networks provided scant discussion of climate change in their coverage of extreme weather events. 2017 was the costliest disaster year in the U.S. history. Weather and climate disasters in the country cost $306 billion in total damages, and 16 extreme weather events each cost more than $1 billion in damages. Hurricanes Harvey, Irma, and Maria were particularly destructive. Maria alone displaced hundreds of thousands of people and may have led to more than 1,000 deaths. Numerous peer-reviewed scientific studies have linked climate change to stronger and more damaging hurricanes, wildfires, droughts, heat waves, and other forms of extreme weather. Recent research has even quantified the extent to which climate change exacerbated specific weather events. For example, in December, two scientific studies reported that climate change had increased Hurricane Harvey's rainfall by at least 15 percent. 2017’s major hurricanes, Harvey, Irma, and Maria, were covered in seven segments that mentioned climate change on PBS (5), CBS (1), and NBC (1). ABC and FOX did not bring up climate change during any segments on the hurricanes. The June heat wave that affected large swaths of the Southwest was covered in two segments that mentioned climate change, one on PBS and one on CBS. The July wildfires in the Western U.S. were covered in one segment on CBS that mentioned climate change. A Florida drought and record rainfall in Missouri were mentioned in a June segment on ABC about climate change. 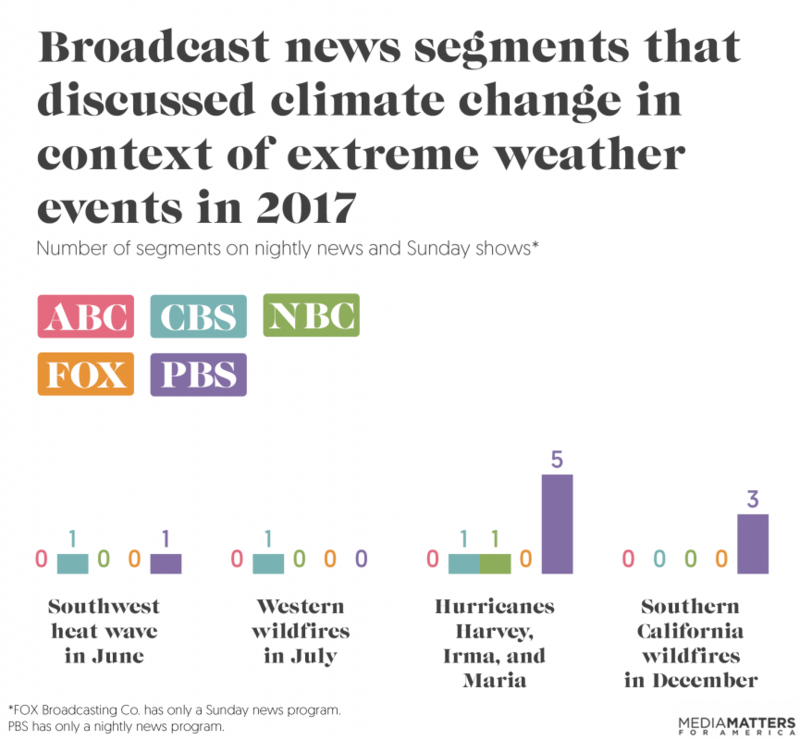 The networks aired an additional 19 segments that mentioned that climate change exacerbates extreme weather, but these segments only discussed the connection in general terms and did not refer to a specific 2017 weather event. Even though the impact of climate change on extreme weather events received too little attention, it was covered more than other important impacts of climate change, such as how it affects public health and national security. The second most covered impact was abnormal weather trends, such as increased global temperatures and melting glaciers. Overall, the many ways that climate change affects human society and the natural world were severely undercovered in 2017. DICKERSON: Does the president believe in climate change, ambassador? DICKERSON: That seems to be a difference from what the president has said. Before he had said, "I do not believe in climate change," and he has called it a "hoax." So you're saying that's not true, he believes in man-made climate change? HALEY: The president believes the climate is changing, and he does know that pollutants are a part of that equation. DICKERSON: So he believes that human activity, which creates those pollutants, leads to climate change. Is that right? HALEY: I mean, John -- John, I just gave you the answer. I mean that's -- that's what he believes. And so that's as clear as I know to give it. CHUCK TODD: Do you believe that CO2 is the primary cause [of climate change]? SCOTT PRUITT: CO2 contributes to climate change, much like-- Methane actually is more potent. TODD: You don't believe that CO2 is the primary cause. PRUITT: No, no. I didn't say that. I said it's a cause. PRUITT: It's a cause of many. It's a cause like methane and water vapor and the rest. TODD: All right, Scott Pruitt, I'm going to leave it there, because I know you've got to run. CBS and PBS hosted guests who flatly denied climate change. CBS and PBS were the only two networks to air interviews with subjects who explicitly disputed the scientific consensus that human activity is the primary cause of global warming. PBS featured more scientists than the other networks combined. 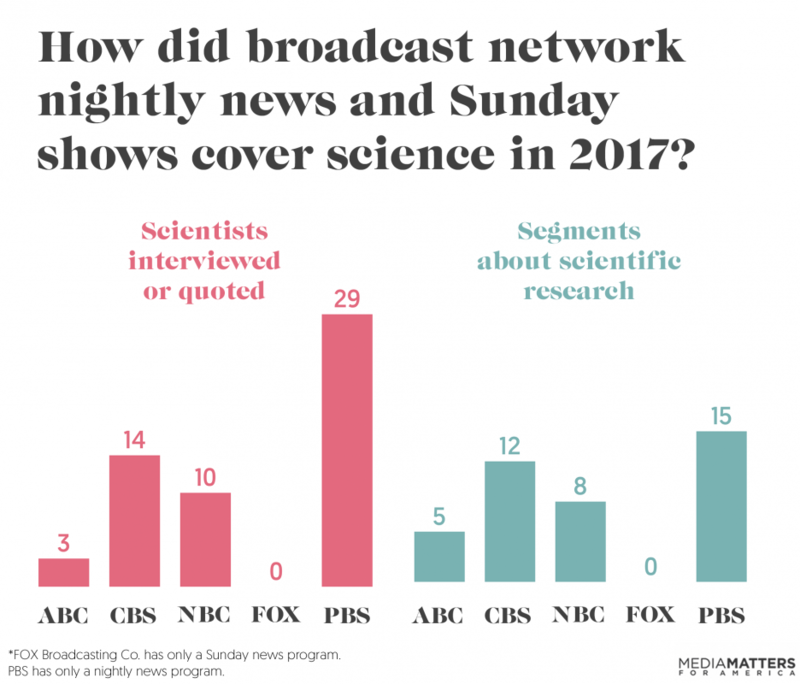 PBS NewsHour interviewed or quoted more scientists in its climate coverage than all the other networks combined -- 29 scientists, compared to a total of 27 scientists for the others. CBS interviewed or quoted 14 scientists, NBC featured 10, ABC featured three, and FOX featured none. Among the corporate broadcast networks, CBS outpaced nightly news competitors. CBS Evening News provided more coverage of climate change (90 minutes) than the other two corporate networks' nightly news shows combined. NBC Nightly News came in second (43 minutes), while ABC’s World News Tonight gave the least amount of coverage (31 minutes). PBS led all broadcast nightly news shows in climate change segments. 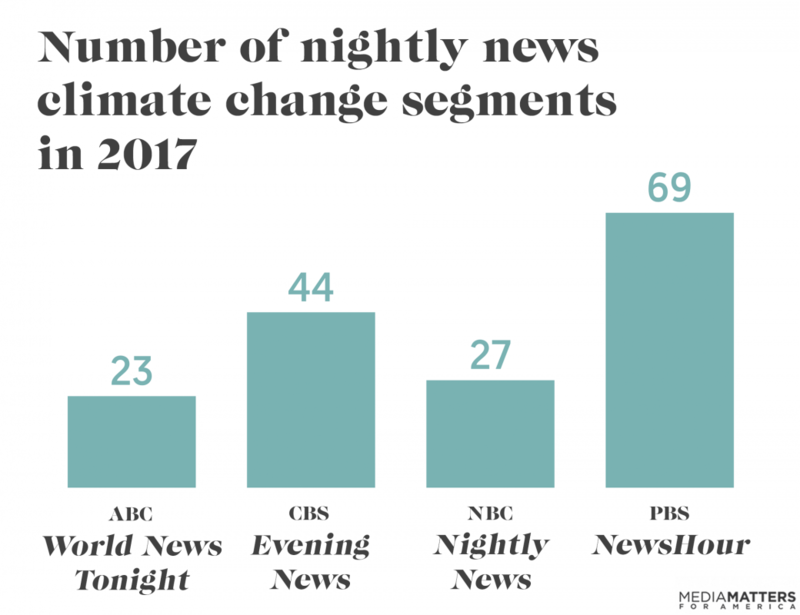 When considering public broadcaster PBS as well as corporate broadcast networks, PBS NewsHour featured the highest number of climate change segments (69), followed by CBS Evening News (44), NBC Nightly News (27), and ABC’s World News Tonight (23). 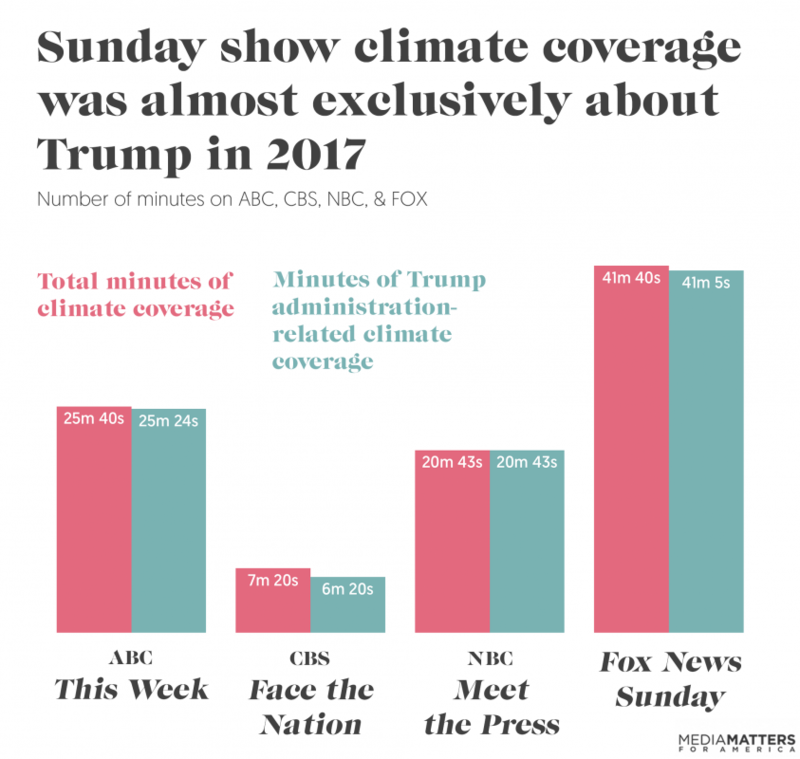 FOX led the Sunday shows in climate coverage. Among the Sunday shows, Fox News Sunday featured the most climate coverage (42 minutes), and CBS’ Face the Nation featured the least (seven minutes). In between were ABC’s This Week (26 minutes) and NBC’s Meet the Press (21 minutes). Evlondo Cooper and Lisa Hymas contributed research to this report. Charts by Sarah Wasko. This report analyzes coverage of climate change between January 1, 2017, and December 31, 2017, on four Sunday news shows (ABC's This Week, CBS' Face the Nation, NBC's Meet the Press, and FOX Broadcasting Co.'s Fox News Sunday) and four nightly news programs (ABC's World News Tonight, CBS Evening News, NBC Nightly News, and PBS NewsHour) based on Nexis transcripts. FOX Broadcasting Co. airs Fox News Sunday but does not air a nightly news equivalent; Fox News is a separate cable channel. PBS NewsHour is a half-hour longer than its network nightly news counterparts, but it airs five days a week, compared to seven days a week for the other nightly news shows (PBS NewsHour Weekend was not included in this analysis). To identify news segments that discussed climate change, we searched for the following terms in Nexis: climate change, global warming, changing climate, climate warms, climate warming, warming climate, warmer climate, warming planet, warmer planet, warming globe, warmer globe, global temperatures, rising temperatures, hotter temperatures, climate science, and climate scientist. In some instances, Nexis categorized a segment that did not mention one of our search terms as being about climate change, and if the segment provided other clear indications that it was indeed about climate change, it was included. In addition, we counted all segments about the Paris climate accord as climate change segments, since the purpose of the accord is to address climate change. To identify segments networks aired on the Paris accord, we ran the following search in Nexis: paris climate, climate accord, paris accord, climate agreement, paris agreement, and climate deal. Our analysis includes any segment devoted to climate change, as well as any substantial mention (more than one paragraph of a news transcript or a definitive statement by a media figure) about climate change impacts or actions. The study did not include instances in which a non-media figure brought up climate change without being prompted to do so by a media figure unless the media figure subsequently addressed climate change. We defined media figures as hosts, anchors, correspondents, and recurring guest panelists. The study also does not include teasers if they were for segments that aired later on the same program. We acquired time stamps from iQ media and applied them generously for nightly news segments when the overall topic was related to climate change. For instance, if a nightly news segment about an extreme weather event mentioned climate change briefly, the entire segment was counted as climate coverage. However, if a significant portion of the segment was not related to climate change, such as a report on a politician giving a speech about climate change, immigration, voting rights, and the economy, only the portions of the segment that discussed climate change were counted. For the Sunday shows, which often feature wide-ranging discussions on multiple topics, we used only the relevant portion of such conversations. In the text of the report, figures have been rounded to the nearest minute. Because PBS NewsHour is an hour-long show and the other networks’ nightly news programs are half-hour shows, our analysis compared PBS NewsHour's climate coverage to other nightly news programs' coverage in terms of topics covered and number of segments, but not in terms of number of minutes.